Groß,maskulin,sehr typ- und ausdrucksvoll,im richtigen Verhältnis stehend,sehr harmonische Ober- und Unterlinie,gerade Front.Vorne und hinten geradetretend,sehr kraftvolle,raumgreifende Gänge aus festem Rücken.Sicheres Wesen,TSB ausgeprägt; läßt ab. He failed bitework due to the previous owners mistakes. Passed his bitework in the last Sieger show with no problems. 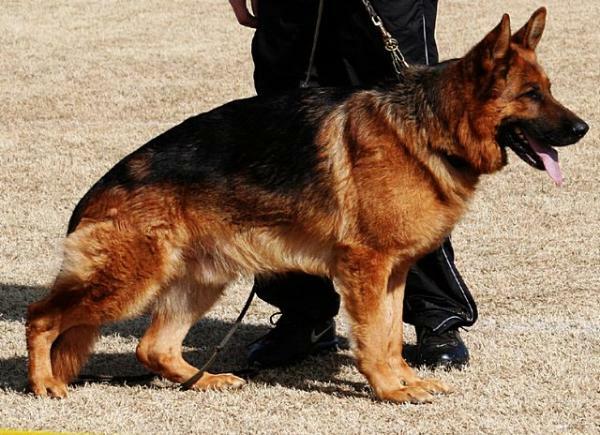 He is a very strong dog and Absoulutely correct structure and beautiful pigment. If it were not for my Bad knees, he would not be for Sale. This Boy loves to work and he is a Very Loyal Dog. I have heard that this dog failed the bitework miserably at the N.A.Sieger Show! Is that why he is now offered for sale!